During the European sovereign debt crisis, lending institutions conditioned rescue packages on austerity measures and growth enhancing measures. The two main ideas behind this mix were that public spending needed to be reined in to sustainable levels, and that sustainability can ultimately be guaranteed by economic growth. After a decade of hot money was over, the search for growth and competitiveness in peripheral countries was mostly targeted towards labour market rigidities. However, the other (and probably more relevant, at least in the eurozone periphery in 2014-see Hassan and Ottaviano on Italy) side of competitiveness has little do with wages and flexibility, and comes mostly from companies. Creating new companies, making existing ones more efficient, and closing unproductive ones should help with the the latter issue. All of this requires investment and know how, and a heavily indebted government is not in the position to provide either. Countries can make long run commitments to producing know how human capital ad ultimately raise productivity, by investing in education and research. This government cut expenditures at every level of education and research. The only possibility in the short run is to attract human, physical, financial and intellectual capital. Portugal also exhibited a focus on the creation of new enterprises, and innovation in general. Lisbon is currently being marketed as a hotbed for startups, various governmental agencies have stakes in venture capital funds, incubators. The extent to which these measures are actually favouring (successful) entrepreneurship is not very clear, especially without serious valuation efforts. Another mean of boosting productivity is to retain and attract skilled individuals and efficient companies, which typically contribute to internal competitiveness and expanding exports (see for example Alfaro and Chen, 2013, also for a overview of recent literature). Countries achieve the goal of attracting companies and individual through a mix of policies, whose typical ingredients include including tax breaks, tax holidays and other favorable fiscal treatments. Was the mix implemented by the government optimal? If not, where could it have been improved? Assessing the combined effects of different measures is beyond the scope of this entry, and perhaps not possible at this stage. However, it seems that an area of immediate improvement is that of stability and predictability. Research on FDI (see for example Calvo, 2002) shows that changing taxes too often repels foreign companies. Ironically, in the first master thesis I supervised at Nova, Alexandra Lourenço, working for UKTI, a British government agency, was comparing empirically the relative attractiveness to investors of various European countries. Her study concluded that the negative correlation between the number of foreign subsidiaries and the variation of taxes, was strong and more significant than that between subsidiaries and the level of taxes. How did the government do in this dimension? The combination of announcement, actual laws, and overturning sentences from the constitutional court paints a bleak picture. Whether because of "unexpected" fiscal slippage, or because of the needs of political compromise requiring a tentative approach, Portugal has seen many variations on its tax rates and base. I will focus here on some examples of these changes, and only on those in which the same items were updated more than once. As the numerous ball games with the Constitutional Court mostly concerned the governmental sector, I will not mention them here. Except to observe that they forced the government to several unexpected taps into the private sector to recoup income, generating uncertainty in (potential) investors or workers. For example, this increased the number of hikes on Personal Income Taxes, with each hike adding uncertainty in future expectations on fiscal issues. Before these hikes the Portuguese government granted a special status (non habitual resident) to individuals not working in Portugal in the previous 5 years, and involved in high value added professions. Not only this rate is lower at 20% than the most rates for residents and non residents, but it also insured against the tax hikes which would accompany the bail out. Unfortunately, the government entirely forgot this insurance aspect and charged all exceptional tax surcharges on this tax regime too. Given the small number of individuals enjoying this regime (less than 100 in the country during 2012), revenues must have been low. The cost was destroying the attractiveness of insurance against fiscal uncertainty in a country in the process of raising taxes. Uncertainty takes many forms, not just that of realised tax rates, but also that of unfulfilled announcements. Turning to social security contribution system, we cannot overlook the infamous TSU blooper of 2012, in which the government announced an increase in the TSU rate combined with a transfer of the burden from firms to workers. Regardless of the potential (but unrealised) effectiveness of the measures, we have to consider the costs of announcing what can be seen as medium-long term increases in labour costs. Unfortunately announcements have no benefits on revenues, but come with a cost on political capital and outside expectations. Another, more common and less radical, type of excess uncertainty is that of delayed reform discussion, approval, and implementation. We can see a case of this in the postponement during 2012 of local government taxation reform. When talking about foreign investment, the main dish of of the menu has to be that of corporate taxation. The government announced an ambitious program of progressive reduction of the CIT rate over several years. It is yet to be seen, whether the announced future rates will be perceived at face value or whether previous twists and turns will be "priced in" and generate unexpectedly low corporate activity and investment, with the ensuing lower tax income, fuelling the need for new changes in the fiscal system. Nova SBE will be hosting a debate on these and related topics on June 30, in the Ciclo de Debates Alfredo de Sousa: "O Investimento Estrangeiro em Portugal"
I took part in a debate on Europe with a Danish, a German and a Spaniard. The moderator was Portuguese (I am Italian). We agreed that many socio-economic issues can only be solved (internalized) at the European level. I wish to present support for an (obvious) point I made during the debate: the existence of necessary common european policies must not weaken the fact that member states have to design policies and structural changes that address specific national issues. Take for example the labor markets. 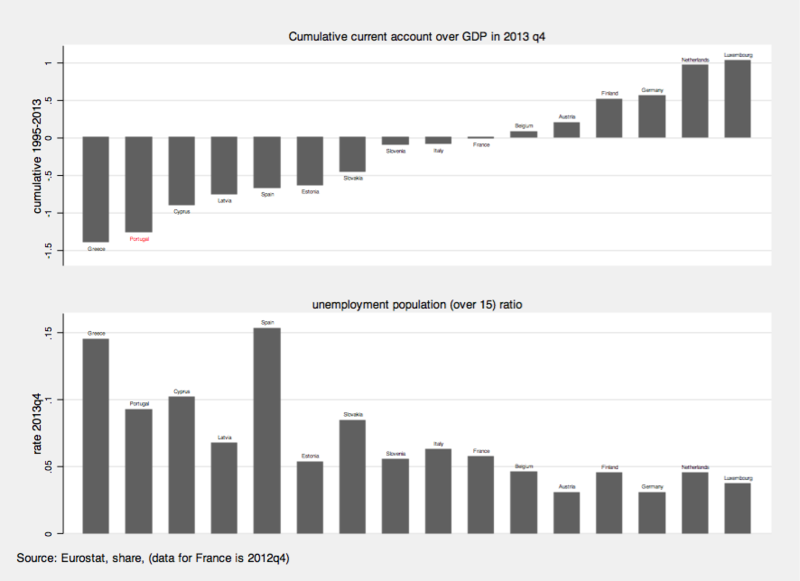 Here I present two figures for the countries represented in the debate plus France (I needed a sixth country to make the figure more symmetric and there is really pas d' Europe sans la France). The data start in 1998 and end 2014. The first figure shows the ratio of total employment over population (age between 15 and 74 years old). 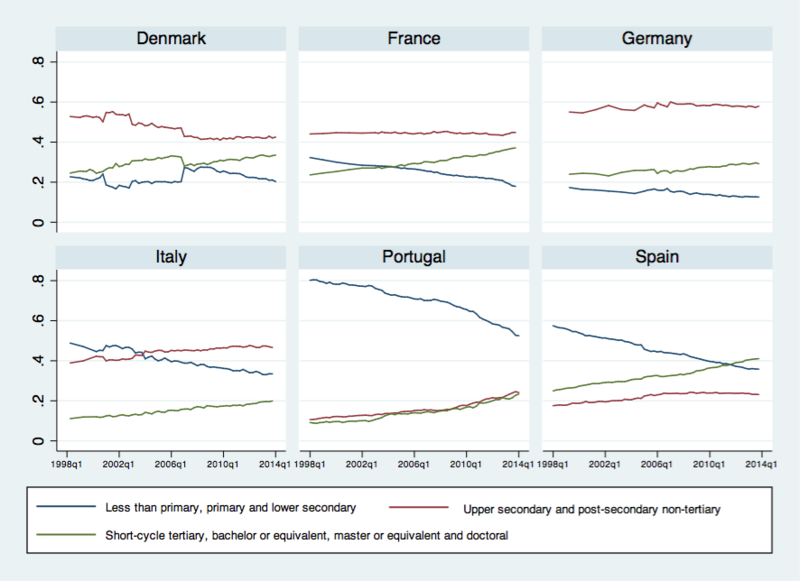 The second figure shows the share of those same workers by educational level attained. Just a few short comments. Italy has the lowest share of employed population. The lower Italian participation reflects the larger shadow economy but not only: women and young participation rates are very low relative to European standards. Certainly this is an important margin for the Italian economy. 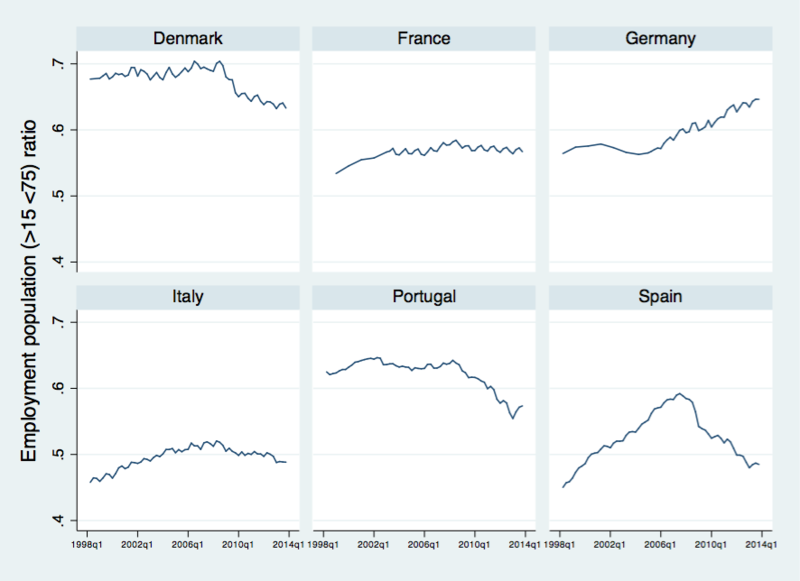 Now look at Portugal: participation is high (it declined strongly because of the crisis) but the labor force is relatively little educated (although there has been improvement). Spain employment-population rate followed the real estate bubble (here causality is easier to deduce) but has also slowly shifted its employed population towards highly educated workers. Denmark, the land of happiness (in the words of the Portuguese moderator), has an outstanding participation rate but the crisis appeared to have hit severely the labor market. Participation in France is a flat-line. Germany's participation was at par with France until 2005, then something changed, and participation started to increase (by 7-8 pp!) inexorably. A very quick look at EU elections. 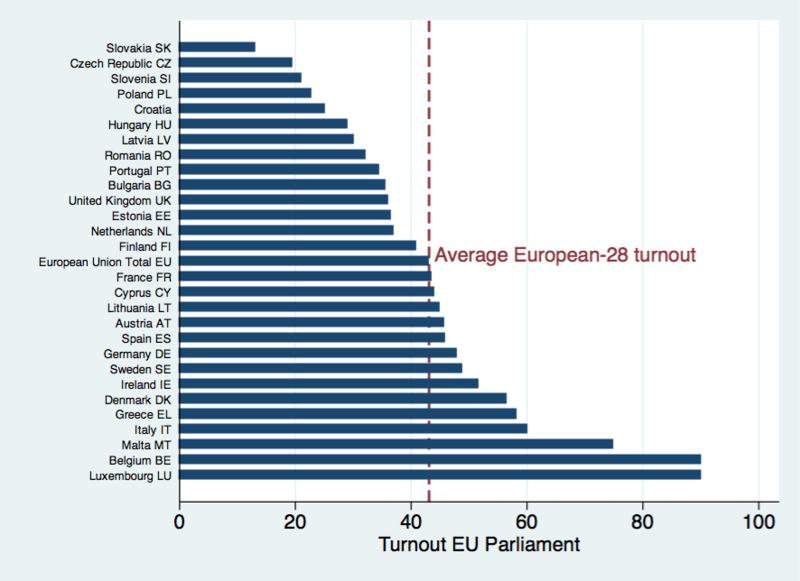 With the important exceptions of the UK, Netherlands and Portugal, turnout, which was overall low, was above average in western Europe. It was very disappointing in eastern Europe (would be curious if there is divide between east and west Germany). For what regards Portugal, I am puzzled. Official numbers put the number of electors at 9.456.201 on the national territory (excluding Portuguese abroad). With a resident population above 18 of approximately 8.4 millions (an upper bound on the number of electors) it looks like Portugal should clean the electoral lists. Consensus exists on what should be the present and future path of the the Portuguese economy. Portugal needs to reach a state of sustained current account surpluses and simultaneously reabsorb a large number of unemployed while deleveraging the balance sheets of the Households, the Government and the Corporations (see Figure 1). Where we see opinions differ vividly is in the actions to implement this path. One end of the opinion spectrum thinks that Portugal should exit the euro, regain monetary policy autonomy, stay in the common market with a devalued escudo and restructure national liabilities. The other end believes that structural reforms coupled with a medium-term consolidation anchored in a coherent euro membership will rebalance and relaunch the economy. The pro-euro-exit narrative follows the textbook description of a devaluation. Real wages will fall, the real exchange rate will depreciate. This will favour temporarily (2-3 years?) employment and the tradable sector. Yes but... economies have evolved faster than textbooks and supply chains, increasing the import content of exports, have likely changed the importance of the nominal exchange rate in determining the trade balance. Portugal is no different and is highly integrated with other producers in Spain, Germany Italy and France. Its energy trade balance is negative (although has improved). Not so sure a nominal devaluation would improve significantly the trade balance (lower labor costs will help). In any case, even with a national currency, the most likely exchange rate arrangement with the rest of the common market would be a fixed or managed exchange regime that de facto will subordinate national monetary policy to the ECB. The extra degree of freedom, which is more a fraction of a degree of freedom, would be that Portugal could change the central parity (value) relative to the euro. One certainty is that financial markets will reflect this possibility in higher interest rates. All assets and liabilities denominated in euro (and other currencies) that do not include the contingency of a change in denomination (if they exist) will see their value increase in terms of the new currency. Given the large negative investment position, strongly biased toward debt, Portugal will need to restructure its liabilities. The restructuring would also be reflected into higher interest rates. The capacity to attract foreign investment will decrease. Finally the exit from the euro and the permanence in the common market is not an option contemplated by the treaties and will have to be negotiated with the rest of the EU members. Would it be a temporary exit with a subsequent medium term strategy to attain the conditions to be part of the euro at a later date, or would it be a change of course towards a more standalone posture vis-a-vis Europe and the World? This uncertainty will imply a disorderly period and diminish any positive effects of the devaluation. It is also true that the adjustment within the euro is difficult. It requires well functioning markets and a coherent currency area. By well functioning I mean markets that permit adjustment through the demand-supply mechanism and deliver competitive outcomes. 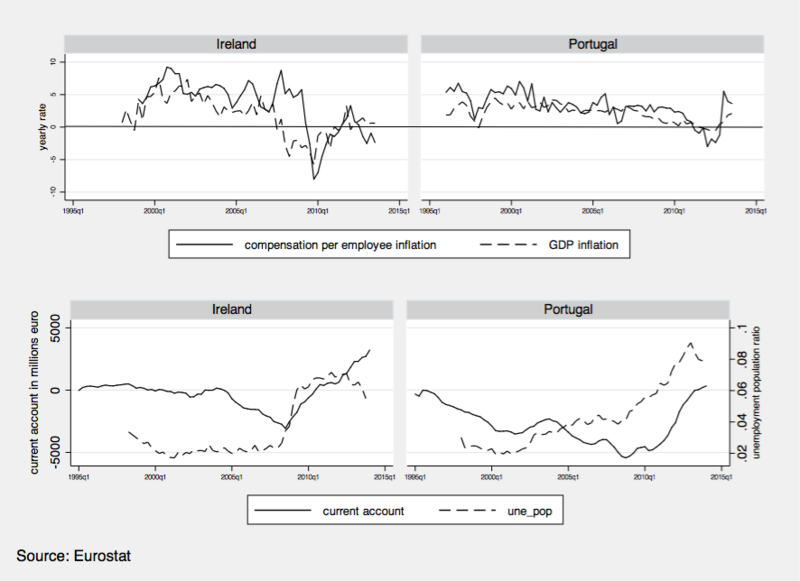 Ireland for example appears to have better functioning markets than Portugal. This did not protect Ireland from the consequences of a tremendous financial shock but helped to quicken the adjustment relative to Portugal. (see Figure 2) The policy prescriptions to improve labor markets functioning are reforms that increase job flexibility and maintain workers protection. Fairness suggests to address both legs, flexibility and protection, simultaneously. The policy prescriptions for better functioning goods markets are to increase competition in the non-tradable and networks sectors. We need to recognise that scale and some market power can be a source of R&D and innovation especially in the ITC and energy sector. If this is the case, the creation of integrated pan-european markets in the network industries can break national resistance to better competition (which is very strong), allow sufficient scale for innovation and simultaneously permit European countries to operate on a level playing field by facing similar telecommunication and energy costs. This is the solution the euro area has adopted with the Banking Union to ensure that firms face similar competitive conditions in crucial inputs such as financial services and credit. The latter goes beyond the competition argument as it also aim at improving the transmission of monetary policy across the euro area. When fully implemented, Portugal like the other periphery countries, will see credit supply conditions improve and be at par with other euro members. Improving competition in the network sectors will help the rebalancing towards the tradable sector. It might not be sufficient to reabsorb sufficiently rapidly the large number of unskilled unemployed. (Can we find non-resident resources to reabsorb the unemployed coming out of the construction sector by finding resources to repair and maintain the existing stock of houses?) To be credible (in the sense of having a positive probability of success), the deleveraging and consolidations processes cannot be made unconditional to the state of the economy. They need to be designed around sound measures of structural unemployment and potential output level and growth. (For example some measures put the structural unemployment rate in Portugal at approximately 13% based on a non accelerating nominal wage model: nominal wages do not decrease therefore the unemployment rate is structural. Assume just for a moment that nominal wages never decrease, then there is no upper bound to the structural unemployment rate measured with this model.) Fiscal consolidation must also be made progressive to have as low as possible recessionary effects and ensure social cohesion and fairness. A note on the euro. Yes we lost the possibility to devalue against other euro members. But was it really such a bonanza to devalue in the past? (read this older post). Yes the nominal convergence started in the mid 1990's towards German rates caused a boom that the periphery was not capable to channel towards higher productivity capital. Portuguese 10 years government bonds went from 11.8% in 1995q1 to 4% in 1999q1. But German interest rates on Bunds went from 7.4% to 4% in the same period: there were (and are) forces beyond the euro at play. Yes some euro zone members do not fully accept that to a current account deficit must correspond a current account surplus. And now the euro-area has the largest current account surplus in the World. With a fairly high unemployment rate. One certainty: international imbalances require international cooperation. Another certainty: inter-nations imbalances within a currency area require its members to have coherent policies. The reform of the state has been set as one of the primary goals of the adjustment program, as a way to avoid future problems of this sort. The notion of reform of the state is very broad, and different meanings have been attached to it: better functioning of the civil service structure (how the Government does it), redefinition of the scope of Government intervention (what the Government does) and the depth of Government intervention (which part is done by the Government and which part is done by the private sector). This way of splitting the several notions of Government reform has never been clear in the political (and policy) discussions about the reform of the state. The document the Government made publicly available is, in this respect, a mix of all three, in a random order, as it clearly resulted from joining contributions from different sources (ministries, I guess). The changes during the troika period along these dimensions were uneven. On the internal procedures of the Government, several measures have been adopted to increased the control of the ministry of finance over the spending ability of individual organisms inside civil service, which are expected to have a long term effect, and many short-term measures (restrictions on what can be done, and how much can be spent) were implemented. Still, a long road waits for the post-troika period. In particular, one point that has been mentioned in several discussions about the issue (check the Sextas da Reforma debates) is the fragmentation of relationships between civil service organisms and the ministry of finance. In terms of redefining the scope of Government, there was no mention about it but for some privatizations that were set as a commitment in the Memorandum of Understanding. In all other areas, in the several documents produced, it was very clear that each minister had (has) if anything a desire to increase the scope of intervention. The discussion of the scope of Government is unlikely to occur in the post-troika period. Finally, the depth of intervention was the area where more discussion took place, even though in an unstructured manner. The main example is given by pensions – where cuts and “generational fairness” (largely undefined in their meaning) are a redefinition of the “depth” of public intervention in the pension system. A different type of action, that has been termed “reform” somewhat too much, is improvement on what the Government does without changing internal procedures, the scope or the depth of intervention – things like changing justice codes, implementing centralized electronic procurement, lowering prices of outsourced services. These hardly constitute a “reform”, they are just better management of what is done. These have been the main focus of action as it is where it becomes easier to find what consultants love, “quick wins”, but they are also easily reversible in the post-troika period. Overall, some progress has been made, more by outside pressure or by financial pressure, not really on a structured decision making process with engagement of society on state reform. Even the efforts may stop in an election year. What is mostly needed is a process, a political process, by which important decisions on scope and depth of Government intervention need to be discussed and then translated into policy action. Richard Sylla’s paper, “Early US Struggles with Fiscal Federalism: Lessons for Europe?”, provides an excellent background regarding European sovereign states and the euro common currency in comparison to the situation of the United States 200 years ago. The young United States came out of the War of Independence heavily indebted, and it took great effort to put the country onto the financial path that led to economic growth and prosperity. From 1781 to ’84 Finance Superintendent Robert Morris made a great effort to bring order to the Treasury but was unable to sort out the prevailing chaos. There were many tasks that needed to be addressed simultaneously, including stabilizing the public finance, managing the war debt, and establishing a stable currency, a central bank, a complete banking system, a stock exchange, and promoting businesses that could lead production, employment, and exports forward. These became possible only following the introduction, in 1790, of the financial program of the first Treasury Secretary (Finance Minister), Alexander Hamilton. Congress approved a new Constitution for the Union in 1788, while Hamilton’s proposals called for assuming the individual American States’ debts as a national debt, thereby promoting cohesion to the cause of American independence. New lending was negotiated and secured to service that national debt, which contributed to global respectability and a national reputation; and a fiscal system with import duties was implemented to balance the needs of the entire financial system. The Bank of the United States was founded in 1791 with the central-bank function of lender-of-last-resort; the U.S. Mint was founded in 1792 in Philadelphia to provide a stable currency based on the “dollar”; and in the same year the New York Stock Exchange was created to serve the existing corporate structure and nurture the next generation of start-ups. The optimist would say that the political parallels with today’s Europe and America’s historical success story predict the way forward for the many independent EU Member States. The euro zone has a stable currency and there is an issuing central bank. If a shared public debt was one of the prices of achieving the American Union, shared public debt is likewise one of the prices of achieving the European Union. And if there are social cleavages in Europe, surely slavery was a greater one in America. Can European national states take any comfort or hope in these parallels regarding the solution of financial problems? Sylla’s paper recognizes that in addition to the obvious historical similarities there are also considerable differences. Europe lacks a European Constitution. Europe also lacks any constitutional principles on which to construct a shared Union public debt, nor are there any mechanisms compelling the individual states to honor such a notion at all. Moreover, even as late as the 1840s the Federal Union refused to bail out certain financially profligate American states, forcing them to face up to their own responsibilities. American cohesion and political will was much stronger in the aftermath of its recently-won independence than it is on the old continent, where bitter rivalry and hostility have been constant factors down through centuries of history. But in the earlier days, lenders were more favorable to the bellicose victors in a new and growing nation, it seems, than they are today in the presence of partner nations who have desires for socially beneficial programs, in peace for several decades. Unlike the United States, Europe is an amalgamation of independent nations and disparate governments, lacking the centralized power to define and enforce a common fiscal policy. This forces each European state to devise its own such policy according to its own needs for servicing its own public debt – as well as according to varying constitutional principles, which may not view public debt commitment in the same way. Credibility is also a crucial factor that differs dramatically between a new-born nation and a complex political construct that has emerged largely as the result of the Marshall Plan, following two long and bloody conflicts that were essentially “European civil wars”, which devastated the “winners” and “losers” alike. As an independent European state, Portugal has a reputation to defend as well as economic growth targets to reach – in an institutional context that differs greatly from the framework and goals of a common European Treasury. Comparative Economic Studies, 2014, Spring: 1-19. I thank Prof. Sylla for allowing me access to the forthcoming paper, and discussion. The Memorandum of Understanding of 17 May 2011 contained a handful of measures intended to increase competitiveness and easy of entry to telecommunications markets in Portugal. None of these measures had to do directly with the economic crisis, but took up existing developments and conflicts with the European Commission. The first of these measures was to implement the European Commission’s “Better Regulation Directive” of 2009, increasing the independence of ICP-Anacom, the Portuguese telecoms regulator. By 2012 this issue was solved, even though rules under the “Citizen’s Rights Directive” of 2002 had still not been satisfactorily implemented. The second measure was the auctioning of more radio spectrum (the previous analog TV spectrum, for fourth-generation data services) in order to increase the possibility of entry, and the reduction of mobile termination rates. The auction was performed, and as it could be expected in the middle of a deep economic crisis, the final bids were equal to the minimum prices set by ICP-Anacom and no entry occurred. Mobile termination rates were further reduced, but this was part of a long-planned regulatory process that has been ongoing for a decade. The third point was the issue of the universal service provider for fixed telephony. The previous government had renewed the universal service concession of Portugal Telecom, without having run a competitive process as by now was mandatory by European Law. In 2013, ICP-Anacom ran a competition which was won by Zon-Optimus, who will become the universal service provider. The last point on the list were measures to facilitate consumer switching between fixed communications provider, such as standardized contracts, and to reduce entry barriers for now providers. To our best knowledge, no additional measures have been put in place in this respect. The main developments in the market actually had little to do with the Troika’s presence. First, commercial strategies of communications providers changed, from offering services such as fixed telephony and broadband, TV, and mobile telephony separately, to selling them all together as a quadruple-play bundle. This move tended to favour companies active in both the fixed and mobile markets, and as such may have led to the long-rumoured merger between the mobile operator Optimus (of Sonaecom, also with a small fixed-line business) and the cable TV operator Zon (ex TV-Cabo) to finally advance. As a result, the communications market in Portugal is getting closer to being a duopoly, even if the mobile operator Vodafone and the cable operator Cabovisão continue to have significant market shares in their respective segments. On the other hand, no decision about regulation of access to next-generation networks (fibre or cable networks under the latest standard), a decisive issue for the development of the market, has been taken, nor has this issue been present in the Memorandum of Understanding. The reason for this delay could be that the European Commission’s Recommendation on Relevant Markets, the list of markets to be regulated, itself was under review (a draft recommendation has been published in early 2014, but the process is not yet finished). Summing up, the presence of the Troika has not led to developments in Portuguese communications markets that would not have happened anyway, and the most important issue for the future development of the market, access to next-generation networks, is not yet resolved. During the nineties of last century a new concept emerged in the agricultural economics literature: rural renaissance. In a simplified way this new concept can be defined as a specific phase in the economic development process of affluent societies, in which the rural world gains higher relative importance. The rural world now includes not only the traditional agricultural activity, but also many of the economic activities usually located in the large urban communities. In other words it means the migration of industries and services from large centers to rural areas. And this movement is also accompanied by the renaissance of agriculture itself, both in terms of new farmers and new technologies. References to renewed agricultural practices have recently been made in Portugal. More specifically it has been said that a few subsectors within agriculture have witnessed important rates of growth in production. 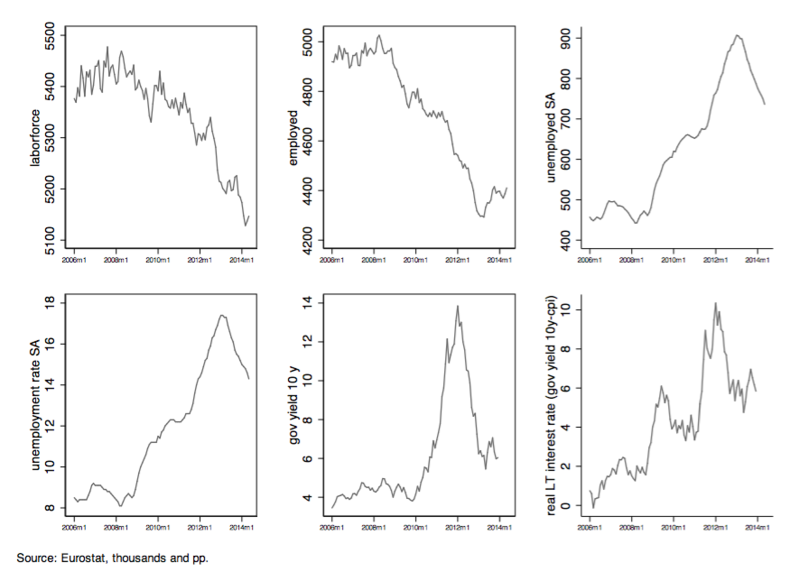 In order to test the existence of such evolution, we looked at the main economic indicators for agriculture in the twenty first century, namely the Output of Agricultural Industry (OAI), the Gross Value Added (GVA), the Gross Fixed Capital Formation (GFCF) and Agricultural Labor Input (ALI). Moreover we tried to identify the subsectors where a notorious production growth could have taken place. In Table 1 it is not possible to detect clear tendencies of growth or contraction either for OAI or GVA. The fluctuations observed must be due to weather randomness rather than any other factor. On the contrary GFCF registers a fall of 2.3% during the period. These same performances are well illustrated in Figure 1. In Table 1 it can also be seen that, contrary to output, total labor input, suffered a fall of about 2.6% annually. Curiously, and has in Figure 2 shows, there is a slowdown in the fall of labor input in the last three years of the period (2011-2013), which has to be attributed to the light increase in non-salaried labor in those years. 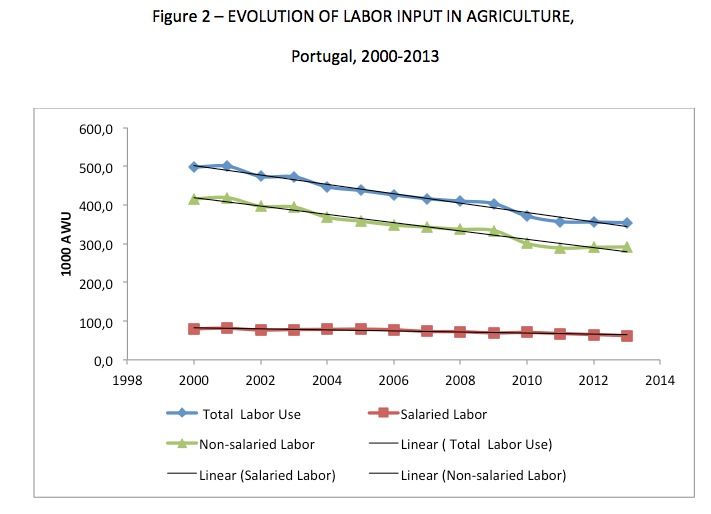 Can it be the case that the increase in self employed labor denotes some renaissance in the Portuguese agricultural sector? And if yes is it a reaction to the unemployment increase in other sectors of the economy as a consequence of the policy measures of the “Program of Economic and Financial Adjustment” imposed by the Troika? The empirical evidence above does not seem enough for a clear cut positive answer, even because the level of total agricultural output did not show significant changes. At most it can be said that the effects of the policy measures had a positive indirect impact on the establishment of new farmers. And this new blood (both in terms of entrepreneurs and technology) may be responsible for the growth dynamics felt in some subsectors of production. Table 2 shows the performance of some of the most important subsectors of crop production, as well as the three classic subsectors of animal production. The table shows that total crop production growth is almost entirely matched by the decrease in animal products, thus confirming the above mentioned stagnation of total agricultural output. But it is also evident that vegetables, fresh fruits and olive trees production have sizable increments (from1.3% annually for vegetables to 9.9% for olive oil). These results definitely helped the good performance of the trade balance in recent years. It was in fact in the crop subsectors of Table 2 that exports grew more significantly. Figures in Table 3 cannot be compared with the above data because the lack of direct information on exports in national and EUROSTAT Statistics forced us to use FAO figures. Besides being expressed in US dollars, product typology does not coincide. The information in the table entirely confirms what was said. To point out only the fact that the value of olive oil exports in 2011 allowed for a first positive trade balance. 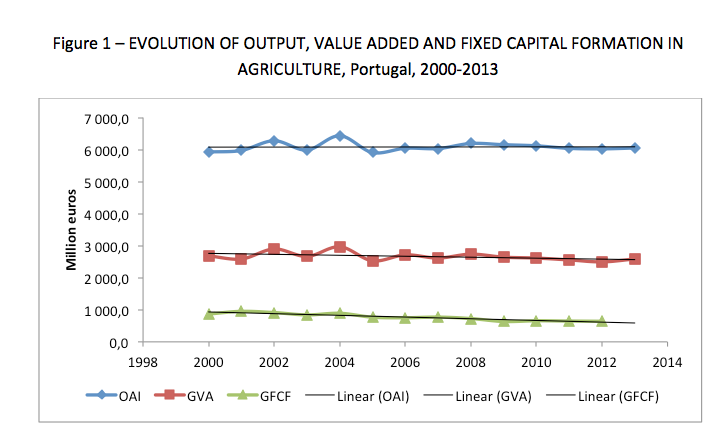 We can then conclude that the policy measures in the “Program of Economic and Financial Adjustment” did not directly affect the Portuguese agricultural sector. On the contrary the dynamic behavior of some subsectors of crop production definitely fitted one of the objectives of such program: the improvement of the Portuguese trade balance.